From diagnostics to treatment, Cogentix Medical has products to support the busy bariatric medicine practice. Cogentix Medical has revolutionized esophagoscopy efficiency with the introduction of the EndoSheath® protective barrier, a sterile, single-use product with an integrated working channel, for use with the company’s state-of-the-art video endoscopy system. The PrimeSightTM Transnasal Esophagoscopy (TNE) System combines state-of-the-art technology with the EndoSheath protective barrier, making it an important tool in the optimal management of bariatric patients from initial consult through post-op pain management. 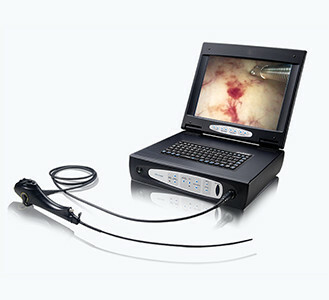 The thin flexible PrimeSight TNE-5000 video endoscope is easily inserted through the nose for immediate visualization of the vocal folds, larynx, esophagus and stomach/GE junction during transnasal esophagoscopy procedures to rule out Barrett’s esophagus and hiatal hernias. In addition, sedation for this procedure is not necessary, minimizing patients’ time away from work or other activities. Using the PrimeSight endoscope with the sterile, single-use EndoSheath product allows physicians to take transnasal esophagoscopy efficiency to the next level with less instrument preparation and disinfection downtime. The EndoSheath product is available in multiple working channel sizes, allowing you to adapt the scope to fit the procedure.